this is my first post. I need your support in choosing the right speakers for my living room. Drawing in the attachment. Living room (Wohnzimmer in german) is about 30m². Small kitchen - around 4m². Speakers will be placed close to the main wall. There will be no table with four chairs. The approximate distance between two speakers would be 3,0 m. The distance of each speaker to couch is also 3,0m. The triangle rule is fulfilled. I consider buying RP-160m or RP-260m and NAD C388 (or NAD C368). According to your experience and expertise which type of speaker would be better for my room? I just need general advice. If there is a better amplifier for Klipsch speakers I am open for any advice.Thank you in advance in greetings from Wien. I always think bigger is better so I would go with floor standers. You you can use a sub but it it were me I would go as big as you can have as long as they don't get in the way . There are people on here much more in the know then I am so lets see what others say. Nice to see you on here by the way! I have the rp280f speakers and they are deep but not that wide so they are easy to place about a ft from the wall. Hope that helps. I'd second using a Reference Premiere floorstanding speaker like a 280f. I've used NAD with Klipsch speakers with good results. Honestly the only amp I've used with Klipsch speakers that didn't sound very good in my opinion are older Pioneer receivers from the 1970's. I'm using a Denon M41 DAB microsystem and sounds really good with the RP 160M bookshelf speakers. 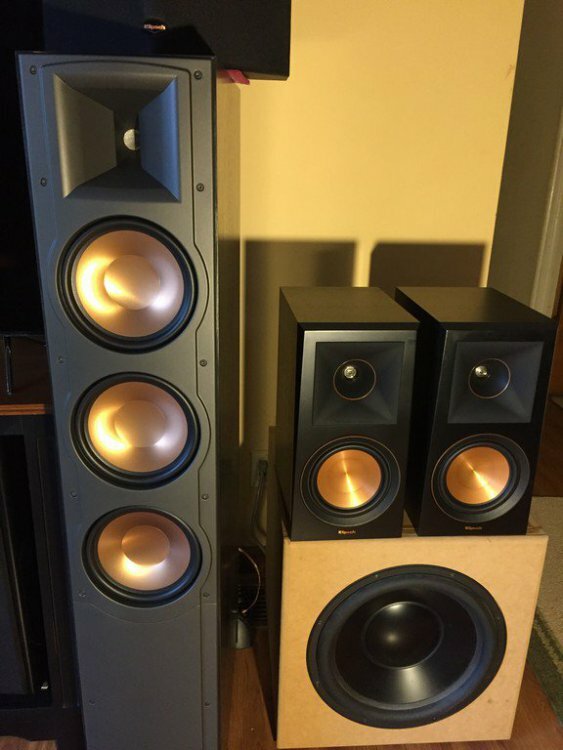 Hi @michalz welcome to the Klipsch forums. I would recommend floor standing speakers for your Left/Right (L/R) speakers. I have the newer version of the RP-160M and they are fantastic but I think the RP-260F with its dual woofers would give you a fuller sound in your wohnzimmer. I don't know much about the NAD amps but I have not heard anything negative about them. Many Klipsch forum members use Marantz or Denon with good success. I have the Marantz 6011 and it sounds great with music and movies with my Klipsch speakers. 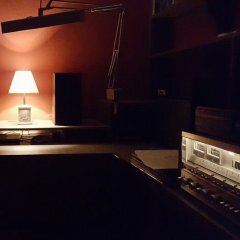 This is my wohnzimmer with RF-83 as L/R. RP-600M on top of 15" sub. That will free up some budget to get a quality DAC like the Schiit GUNGNIR. I believe the amplifiers he mentioned are class D. I have their littler sibling (338). Floor-standing speakers couple the bass better and by the time you put a stand under bookshelf models you've taken up about the same amount of space anyway. I've gotten a pair of Forte III and that would be my recommendation in this case, even though it was not mentioned as a consideration. NAD is good amp usually providing for slightly warmer sound with still enough detail. So Klipsch and NAD should pair fairly well. 30 square meters is a proper sized space for average speakers. You should not have problems with both sets (bookshelves or floorstanders). If you are going to use them for 2-chanel I suppose they will be placed on your north wall between the balcony and the kitchen. It would be beneficial to think about room acoustics. On your left side you can put some denser curtains where that big window and doors are to absorb the first reflections. But I am not sure what you can do to your right side toward the kitchen. You can also think about placing a carpet between the speakers and a listening position. Try to audition both sets of speakers before buying. If possible, auditioning should be done in a room similar to the size of your living room. I agree with floor standing speakers. It also depends what kind of music you listen to. The bigger the orchestra the larger the speakers need to be. 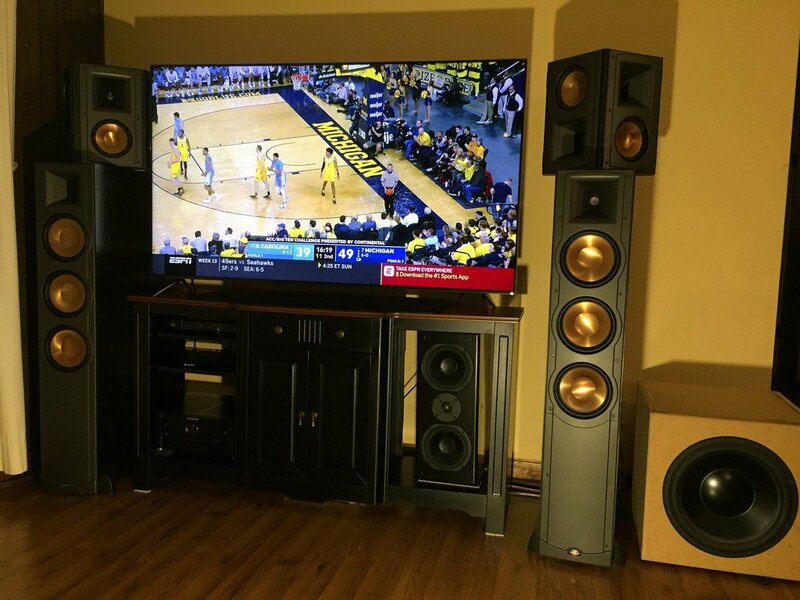 I have a Yamaha A-S 1100 with LaScalas for exclusively classical music the power and detail is there but they are tricky with placement if you don’t have the ideal room dimensions, i.e., a 30ft long wall to place them at, in my case. If placing bookshelf speakers on stands you will need to use a subwoofer to assure a solid bottom end. Floorstanders if you can swing it. 'Ideal' is an opinion. I've had mine as close as 6 feet center to center. Imaging was superb and the soundstage was wider than the speaker distance. Never have been happy with them on a longer wall, 20 ft. being the furthest apart I have tried. Total and proper room treatments are what will give you the ideal room. As to the OP, I would opt for floorstanders. One of my long term goals is to build new cabinets that are the size of Klipsch Tangent 400s and put all the drivers/parts from my Heresy IIs. That will get me better bass and raise the mid and tweeter more to ear level. That's interesting, thanks. I have a similar setup, 7' feet apart on the short wall of the room. I am very happy with the sound but always curious what it would sound like if I followed the long wall "guideline", but like you said I have to pay close attention to room treatments, in my case to tackle resonants. It's good to know your experience with a long wall placement. A very subjective question with a few factors to consider. Both floor standers and stand mounts with a sub have strengths and disadvantages. Another factor to consider is straight up aesthetics in your unit. Although the actual floor foot print of a nice stand and a floor standing speaker will be similar, the standmounts look like they take up less space and are not as visually dominating in a room. Your plan appears to be that of a condo (I live in one), if this is the case, the reality is that you will never be playing them as loud as would someone in an actual house. Neighbors beside, above and below change the equation. I wanted to circle back with you and thank you for you comment on having had you speakers relatively close. I guess I was more fixated on the fact that since I didn’t have a long wall to place the speakers I would have to accommodate with trying to find as much space as possible between them on a short wall. But that resulted in them being too close to the side walls which created echo/booming etc, and therefore a poor soundstage. I then gave it try and shortened the distance to 6ft and that gave me a foot on either side of the walls and that solved the problem. I thought I had to do a lot more room accoustic treatments, but this adjustment improved the sound by a lot. For what its worth I am running the NAD C368 with a pair of RP-600M and a R-100SW in a room of similar size with good results, The 2 speakers are in the corners about 60cm out from the wall and about 4 1/2 meters apart with the sub in a rear corner behind the listening position (which is a perfect triangle).It sounds fantastic in that set up however I did try them either side of entertainment cabinet about 6 feet (as above comment) and they sounded awesome as well,I found its moving and angling them in small movements to get the ideal set up. My Forte IIIs do dual duty music and 2.0 television. Plenty of thumps on the soundtracks and I'm surprised that I don't miss any method to boost bass (that's to say I've got no tone or "loudness" options) even at whisper levels. Best money I've ever spent on audio gear, by way far. I use NADs with my Klipschorns, Belle Klipsch center and Heresy II surrounds. They sound great. The only amp I've had that sounded better was a Luxman, but they cost an arm and a leg. After a mere 22 years, at about 6 hours per day, my Luxman self-destructed, and was so burned out inside that the Luxman repair station didn't want to repair it. I'd go for floor standers, for all the reasons people have given, and, when you can afford it, get a subwoofer anyway. Stands tend to degrade the bass; if you eventually get a subwoofer and cross it over at the usual 80 Hz or below, the bass from 80 Hz up to about 200 Hz might still get degraded by stands.